"Pagan" redirects here. For other uses, see Pagan (disambiguation). Contemporary knowledge of old pagan religions comes from several sources, including anthropological field research records, the evidence of archaeological artifacts, and the historical accounts of ancient writers regarding cultures known to Classical antiquity. It is crucial to stress right from the start that until the 20th century, people did not call themselves pagans to describe the religion they practised. The notion of paganism, as it is generally understood today, was created by the early Christian Church. It was a label that Christians applied to others, one of the antitheses that were central to the process of Christian self-definition. As such, throughout history it was generally used in a derogatory sense. The adoption of paganus by the Latin Christians as an all-embracing, pejorative term for polytheists represents an unforeseen and singularly long-lasting victory, within a religious group, of a word of Latin slang originally devoid of religious meaning. The evolution occurred only in the Latin west, and in connection with the Latin church. Elsewhere, Hellene or gentile ( ethnikos) remained the word for pagan; and paganos continued as a purely secular term, with overtones of the inferior and the commonplace. In the Latin-speaking Western Roman Empire of the newly Christianizing Roman Empire, Koine Greek became associated with the traditional polytheistic religion of Ancient Greece, and regarded as a foreign language (lingua peregrina) in the west. By the latter half of the 4th century in the Greek-speaking Eastern Empire, pagans were—paradoxically—most commonly called Hellenes (Ἕλληνες, lit. 'Greeks'). The word almost entirely ceased being used in a cultural sense. It retained that meaning for roughly the first millennium of Christianity. 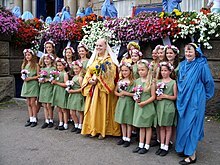 The term has recently been revived in the forms Heathenry and Heathenism (often but not always capitalized), as alternative names for the Germanic neopagan movement, adherents of which may self-identify as Heathens. It is perhaps misleading even to say that there was such a religion as paganism at the beginning of [the Common Era] ... It might be less confusing to say that the pagans, before their competition with Christianity, had no religion at all in the sense in which that word is normally used today. They had no tradition of discourse about ritual or religious matters (apart from philosophical debate or antiquarian treatise), no organized system of beliefs to which they were asked to commit themselves, no authority-structure peculiar to the religious area, above all no commitment to a particular group of people or set of ideas other than their family and political context. If this is the right view of pagan life, it follows that we should look on paganism quite simply as a religion invented in the course of the second to third centuries AD, in competition and interaction with Christians, Jews and others. Paganism resurfaces as a topic of fascination in 18th to 19th-century Romanticism, in particular in the context of the literary Celtic and Viking revivals, which portrayed historical Celtic and Germanic polytheists as noble savages. 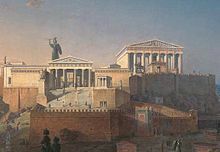 Romanticist interest in non-classical antiquity coincided with the rise of Romantic nationalism and the rise of the nation state in the context of the 1848 revolutions, leading to the creation of national epics and national myths for the various newly formed states. 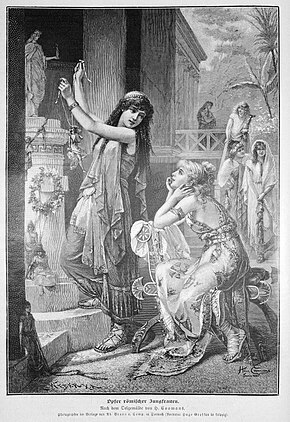 Pagan or folkloric topics were also common in the Musical nationalism of the period. 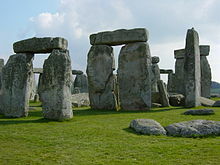 Some megaliths are believed to have religious significance. 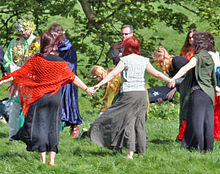 Modern Paganism, or Neopaganism, includes reconstructed religions such as Roman Polytheistic Reconstructionism, Hellenism, Slavic Native Faith, Celtic Reconstructionist Paganism, or Heathenry, as well as modern eclectic traditions such as Wicca and its many offshoots, Neo-Druidism, and Discordianism. 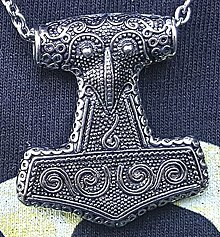 The hammer Mjölnir is one of the primary symbols of Germanic neopaganism. A retronym coined to contrast with Neopaganism, original polytheistic, nature-centered faiths, such as the pre-Hellenistic Greek and pre-imperial Roman religion, pre-Migration period Germanic paganism as described by Tacitus, or Celtic polytheism as described by Julius Caesar. A group, which is, or has been, significantly influenced by monotheistic, dualistic, or nontheistic worldviews, but has been able to maintain an independence of religious practices. This group includes aboriginal Americans as well as Aboriginal Australians, Viking Age Norse paganism and New Age spirituality. Influences include: Spiritualism, and the many Afro-Diasporic faiths like Haitian Vodou, Santería and Espiritu religion. Isaac Bonewits includes British Traditional Wicca in this subdivision. A movement by modern people to revive nature-revering/living, pre-Christian religions or other nature-based spiritual paths, frequently also incorporating contemporary liberal values[ citation needed] at odds with ancient paganism. [ citation needed] This definition may include groups such as Wicca, Neo-Druidism, Heathenry, and Slavic Native Faith. Polytheism: Pagan religions recognise a plurality of divine beings, which may or may not be considered aspects of an underlying unity (the soft and hard polytheism distinction). Nature-based: Pagan religions have a concept of the divinity of nature, which they view as a manifestation of the divine, not as the fallen creation found in dualistic cosmology. ^ J. J. O'Donnell (1977), Paganus: Evolution and Use, Classical Folia, 31: 163–69. ^ Augustine, Divers. Quaest. 83. ^ a b c Peter Brown (1999). "Pagan". In Glen Warren Bowersock; Peter Brown; Oleg Grabar (eds.). Late Antiquity: A Guide to the Postclassical World. Harvard University Press. pp. 625–626 p=625. ISBN 978-0-674-51173-6. ^ a b Jones, Christopher P. (2014). Between Pagan and Christian. Cambridge, Massachusetts: Harvard University Press. ISBN 978-0-674-72520-1. ^ Owen Davies (2011). Paganism: A Very Short Introduction. Oxford University Press. pp. 1–2. ISBN 978-0-19-162001-0. ^ Kaarina Aitamurto (2016). Paganism, Traditionalism, Nationalism: Narratives of Russian Rodnoverie. Routledge. pp. 12–15. ISBN 978-1-317-08443-3. ^ Owen Davies (2011). Paganism: A Very Short Introduction. Oxford University Press. pp. 1–6, 70–83. ISBN 978-0-19-162001-0. ^ Lewis, James R. (2004). The Oxford Handbook of New Religious Movements. Oxford University Press. p. 13. ISBN 0-19-514986-6. ^ Hanegraff, Wouter J. (1006). New Age Religion and Western Culture: Esotericism in the Mirror of Secular Thought. Brill Academic Publishers. p. 84. ISBN 90-04-10696-0. ^ a b Cameron 2011, pp. 28, 30. ^ Davies, Owen (2011). Paganism: A Very Short Introduction. New York: Oxford University Press. ISBN 9780191620010. ^ a b Harper, Douglas. "pagan (n.)". The Online Etymology Dictionary. Retrieved 18 July 2013. ^ Peter Brown, in Glen Warren Bowersock, Peter Robert Lamont Brown, Oleg Grabar, eds., Late Antiquity: a guide to the postclassical world, 1999, s.v. Pagan. ^ a b c d Cameron 2011, pp. 14—15. ^ "The City of God". Britannica Ultimate Reference Suite DVD, 2003. ^ Orosius Histories 1. Prol. "ui alieni a civitate dei..pagani vocantur." ^ The OED instances Edward Gibbon's Decline and Fall of the Roman Empire, Vol. II, "Chapter XXI: Persecution of Heresy, State of the Church.—Part VII" (1776): "The divisions of Christianity suspended the ruin of Paganism." ^ Eisenstadt, S.N., 1983, Transcendental Visions – Other-Worldliness – and Its Transformations: Some More Comments on L. Dumont. Religion13:1–17, at p. 3. ^ Augustine, Confessions 1.14.23; Moatii, "Translation, Migration, and Communication," p. 112. ^ a b c Cameron, Alan G.; Long, Jacqueline; Sherry, Lee (1993). "2: Synesius of Cyrene; VI: The Dion". Barbarians and Politics at the Court of Arcadius. University of California Press. pp. 66–67. ISBN 9780520065505. ^ a b Cameron 2011, pp. 16—17. ^ Simon Swain, "Defending Hellenism: Philostratus, in Honour of Apollonius," in Apologetics, p. 173. ^ Treadgold, A History of the Byzantine State, p. 5. ^ Millar, A Greek Roman Empire, pp. 97–98. ^ Millar, A Greek Roman Empire, p. 98. ^ Harper, Douglas. "heathen (n.)". The Online Etymology Dictionary. Retrieved 18 July 2013. ^ Cameron 2011, pp. 26—27. ^ a b Davies 2011, Defining paganism. ^ Cameron 2011, p. 26. ^ Cameron 2011, pp. 27, 31. ^ Cameron 2011, p. 29. ^ Cameron 2011, p. 28. ^ Davies 2011, Chapter 1: The ancient world. ^ A summary of the modern view is given in Robin Lane Fox, Pagans and Christians 1989, pp. 31 ff. : "The modern emphasis on paganism's cult acts was also acknowledged by pagans themselves. It shaped the way they tried and tested Christians." ^ a b Wick, Peter (2004). "Jesus gegen Dionysos? Ein Beitrag zur Kontextualisierung des Johannesevangeliums". Biblica. Rome: Pontifical Biblical Institute. 85 (2): 179–198. Retrieved 10 October 2007. ^ Powell, Barry B., Classical Myth Second ed. With new translations of ancient texts by Herbert M. Howe. Upper Saddle River, New Jersey: Prentice-Hall, Inc., 1998. ^ Sa'd, Ibn (1967). Kitab al-tabaqat al-kabir, By Ibn Sa'd, Volume 2. Pakistan Historical Society. p. 380. ASIN B0007JAWMK. ^ Robertson Smith, William (2010). Kinship and Marriage in Early Arabia. Forgotten Books. p. 297. ISBN 978-1-4400-8379-2. ^ S. Salibi, Kamal (2007). Who Was Jesus? : Conspiracy in Jerusalem. Tauris Parke Paperbacks. p. 146. ISBN 978-1-8451-1314-8. ^ Muir, William (August 1878). The life of Mahomet. Kessinger Publishing. p. 219. ^ Mubarakpuri, Saifur Rahman Al (2002). When the Moon Split. DarusSalam. p. 296. ISBN 978-9960-897-28-8. ^ Glasse, Cyril (28 January 2003). The new encyclopedia of Islam. US: AltaMira Press. p. 251. ISBN 978-0-7591-0190-6. ^ Ibn al Kalbi, Hisham (1952). The book of idols: being a translation from the Arabic of the Kitāb al-asnām. Princeton University Press. pp. 31–2. ASIN B002G9N1NQ. ^ The Book of Idols, Scribd, archived from the original on 26 August 2011, retrieved 9 September 2017 . ^ "Hellenismos FAQ". The Cauldron: A Pagan Forum. Retrieved 25 March 2015. ^ "Pagans". Supreme Council of Ethnikoi Hellenes. Retrieved 7 September 2007. ^ Arlea Anschütz, Stormerne Hunt (1997). "Call us Heathens!". Journal of the Pagan Federation. Retrieved 7 September 2007. ^ "Pagan beliefs: nature, druids and witches". BBC Religion & Ethics. Retrieved 25 March 2015. ^ Jones, Prudence; Pennick, Nigel (1995). A History of Pagan Europe. Page 2. Routledge. ^ "Paganism: Heathenry". BBC – Religions. Retrieved 25 March 2015. ^ "The Odinic Rite of Australia". The Odinic Rite of Australia. Retrieved 25 March 2015. Cameron, Alan G. (2011). The Last Pagans of Rome. New York, New York: Oxford University Press. ISBN 9780199780914. OCLC 553365192. Davies, Owen (2011). Paganism: A Very Short Introduction. New York: Oxford University Press. ISBN 9780191620010. Hua, Yih-Fen. book review to: Maria Effinger / Cornelia Logemann / Ulrich Pfisterer (eds): Götterbilder und Götzendiener in der Frühen Neuzeit. Europas Blick auf fremde Religionen. In: sehepunkte 13 (2013), Nr. 5 [15.05.2013], URL: http://www.sehepunkte.de/2013/05/21410.html. (Book review in English). Robert, P. & Scott, N., (1995) "A History of Pagan Europe". New York, Barnes & Noble Books, ISBN 0-7607-1210-7. York, Michael, Pagan Theology: Paganism as a World Religion NYU Press (2003), ISBN 0-8147-9708-3.